In Crystal Reports for Enterprise, you can access SAP HANA data by using an existing relational connection created using the information design tool. 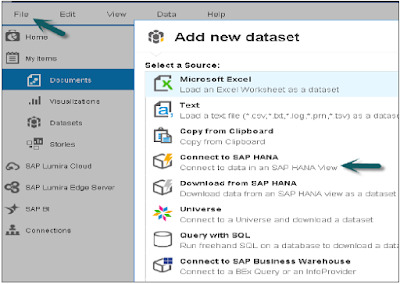 You can also connect to SAP HANA using an OLAP connection created using information design tool or CMC. Design Studio can access SAP HANA data by using an existing OLAP connection created in Information design tool or CMC same like Office Analysis. Dashboards can connect to SAP HANA only through a relational Universe. Customers using Dashboards on top of SAP HANA should strongly consider building their new dashboards with Design Studio. Web Intelligence can connect to SAP HANA only through a Relational Universe. Lumira can connect directly to SAP HANA Analytic and Calculation views. It can also connect to SAP HANA through SAP BI Platform using a relational Universe. In Office Analysis edition for OLAP, you can connect to SAP HANA using an OLAP connection defined in the Central Management Console or in Information design tool. You can create an information space based on an SAP HANA view using JDBC drivers. We can create an OLAP Connection for all the BI tools, which we want to use on top of HANA views like OLAP for analysis, Crystal Report for enterprise, Design Studio. Relational connection through IDT is used to connect Web Intelligence and Dashboards to HANA database. These connection can be created using IDT as well CMC and both of the connections are saved in BO Repository. Login to CMC with the user name and password. From the dropdown list of connections, choose an OLAP connection. It will also show already created connections in CMC. To create a new connection, go to green icon and click on this. Enter the name of an OLAP connection and description. Multiple persons, to connect to HANA views, in different BI Platform tools, can use this connection. It also gives an option to connect to a single Cube (You can also choose to connect to single Analytic or Calculation view) or to the full HANA system. Click on Connect and choose modeling view by entering user name and password. Authentication Types − Three types of Authentication are possible while creating an OLAP connection in CMC. Predefined − It will not ask user name and password again while using this connection. Enter user − user name and password for HANA system and save and new connection will be added to existing list of connections. Now open BI Launchpad to open all BI platform tools for reporting like Office Analysis for OLAP and it will ask to choose a connection. By default, it will show you the Information View if you have specified it while creating this connection otherwise click on Next and go to folders → Choose Views (Analytic or Calculation Views). Difference between connect to SAP HANA and download from SAP HANA is that it will download data from Hana system to BO repository and refreshing of data will not occur with changes in HANA system. 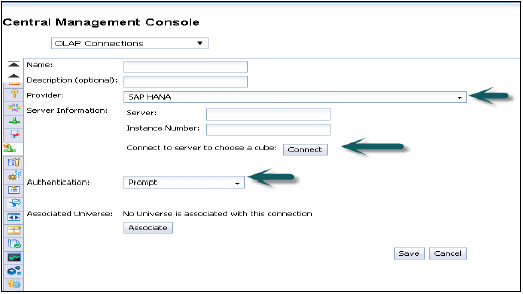 Enter HANA server name and Instance number. Enter user name and password → click on Connect. It will show all views. You can search with the view name → Choose View → Next. It will show all measures and dimensions. You can choose from these attributes if you want → click on create option. Prepare − You can see the data and do any custom calculation. Visualize − You can add Graphs and Charts. Click on X axis and Y axis + sign to add attributes. Compose − This option can be used to create sequence of Visualization (story) → click on Board to add numbers of boards → create → it will show all the visualizations on left side. Drag first Visualization then add page then add second visualization. Share − If it is built on SAP HANA, we can only publish to SAP Lumira server. Otherwise you can also publish story from SAP Lumira to SAP Community Network SCN or BI Platform. Open Information Design Tool → by going to BI Platform Client tools. Click on New → Project Enter Project Name → Finish. Right-click on Project name → Go to New → Choose Relational Connection → Enter Connection/resource name → Next → choose SAP from list to connect to HANA system → SAP HANA → Select JDBC/ODBC drivers → click on Next → Enter HANA system details → Click on Next and Finish. You can also test this connection by clicking on Test Connection option. Test Connection → Successful. Next step is to publish this connection to Repository to make it available for use. Right Click on connection name → click on Publish connection to Repository → Enter BO Repository name and password → Click on Connect → Next →Finish → Yes. It will create a new relational connection with .cns extension. .cns − connection type represents secured Repository connection that should be used to create Data foundation. .cnx − represents local unsecured connection. If you use this connection while creating and publishing a Universe, it will not allow you to publish that to repository. Choose .cns connection type → Right Click on this → click on New Data foundation → Enter Name of Data foundation → Next → Single source/multi source → click on Next → Finish. It will show all the tables in HANA database with Schema name in the middle pane. Import all tables from HANA database to master pane to create a Universe. Join Dim and Fact tables with primary keys in Dim tables to create a Schema. Double Click on the Joins and detect Cardinality → Detect → OK → Save All at the top. Now we have to create a new Business layer on the data foundation that will be consumed by BI Application tools. Right Click on .dfx and choose new Business Layer → Enter Name → Finish →. It will show all the objects automatically, under master pane →. Change Dimension to Measures (Type-Measure change Projection as required) → Save All. Right-click on .bfx file → click on Publish → To Repository → click on Next → Finish → Universe Published Successfully. Now open WebI Report from BI Launchpad or Webi rich client from BI Platform client tools → New → select Universe → TEST_SAP_HANA → OK.